Gladiators have always been the most fascinating facet of the ancient Roman empire. While the Romans resembled the present day urbans in many ways including having an organized society, fixed set of country laws, organized towns, etc there is this one thing about their mode of entertainment that sets them apart. For almost 650 years, people flocked to the arenas to watch Roman Gladiators engage in a bloody spectacle with each other and sometimes with wild beasts like lions. All for the sake of entertainment! Let us get our facts right about these handsome, brave, tough men with great fighting expertise. Yes, let’s give it up for our fearless Gladiators of Rome. Most of the early combatants at the Roman arenas were slaves of war or those who had committed crimes. However, after a few years, many free young men got lured by the thrill of these fights and the dream to become a hero of the crowds thronging to see the bloodbath and applaud the winner. They enrolled in Gladiator schools, signed contracts and came for the prize money and winning glory. These included ex-soldiers, knights, high class patricians and sometimes even senators. In order to keep the crowds hooked to the sport, organizers found a different angle to the gladiatorial fight. They bought female gladiators to fight in the arena, something which was quite different from the tradition of men fighting as gladiators. And yes, not all women fighting were slaves, some of the wealthy women also came to show their fighting pedigree. Evidences from ancient Roman art show that female gladiators fought naked wearing only a loincloth and without helmets (so that their hair could be seen) to titillate the crowds and keep them engaged. Most Hollywood movies depict that Roman Gladiators always died in the bouts in the showground. However, the truth is that most of these fights were operated under strict set of rules and regulations. Referees were always present to oversee the action and the combatants were always men of same size and expertise. They were trained to avoid hurting their brothers in arms to death. While wounding their opponents and not killing them were a part of the training of the Gladiators of Rome, still the lives of the bravehearts were usually very brutal and short. Historians estimate that most of them lived till the mid 20s only and 1 in every 5 or 10 fights usually resulted in the death of a Gladiator. 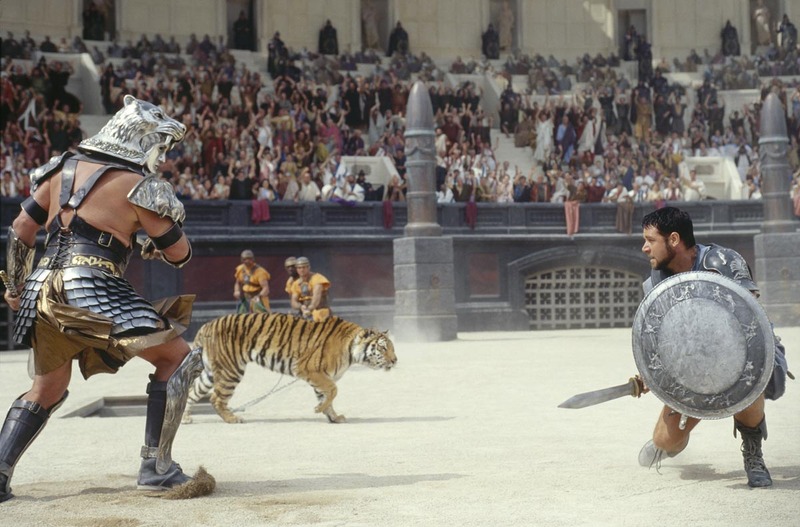 Some organizers made gladiators fight with wild beasts like lions, tigers, elephants and sometimes hippopotamuses, rhinoceroses, wild horses, etc. The Roman crowd loved exotic animals but as these animals were expensive few such fights were organized but they were great crowd-pullers. Not all gladiators but only the “bestarius” who were specially trained in fighting animals fought in these shows. Most animals were killed brutally for the fun and adventure of the blood thirsty Roman mob.